The motor was getting a bit toasty after long uphill drives. 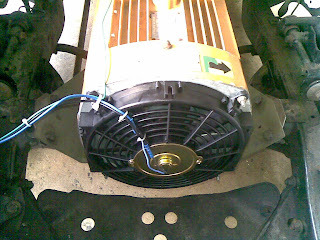 During operation the motor was cool enough but as soon as there was no air movement, the heat had nowhere to go. 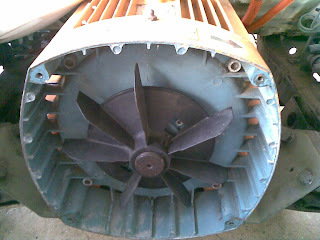 I removed the shaft fan and replaced it with a 10 inch 'ICE' brand electric fan. The fan was attached to an aluminum plate to prevent air escaping around the fan. Coincidentally the fan mounting holes almost line up with the 4 bolt holes. I 'moved' the holes in the plastic fan by about 5mm and it looks like it was made to fit! 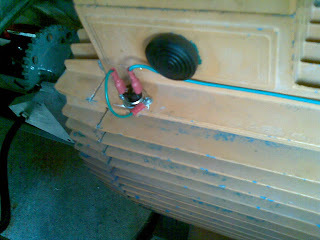 There is a 50 deg C 'clickson' NO thermal switch that drives a relay, that in turn drives the fan direct from the battery. This way the fan can run if necessary even if the key is off when most needed. Air flow around the motor is very will designed. The air is blown toward the rear of the motor length ways down the cooling fins and the air exits at the rear of the motor. i have also removed the air dam from the radiator opening to allow improved cooling. The motor is noticeably quieter which is a nice touch. Here are some photos of the installation. As always Mal. Great blog, great detail. Thanks.